so i already shared with you my favorite go-to paint colors in a previous post, but how does one find the perfect backdrop for their particular space? luckily, most paint manufactures realize that, while their awe-inspiring wall of colored paint chip options might elicit the inner hidden artist in some, it can also be super intimidating – even fear inducing – for others when considering the many many choices available. to that point, the paint companies offer small “color pots” for customers to purchase – once they’ve narrowed it down to their few favorites – to sample in their own space….and in-situation sampling is so very important!! 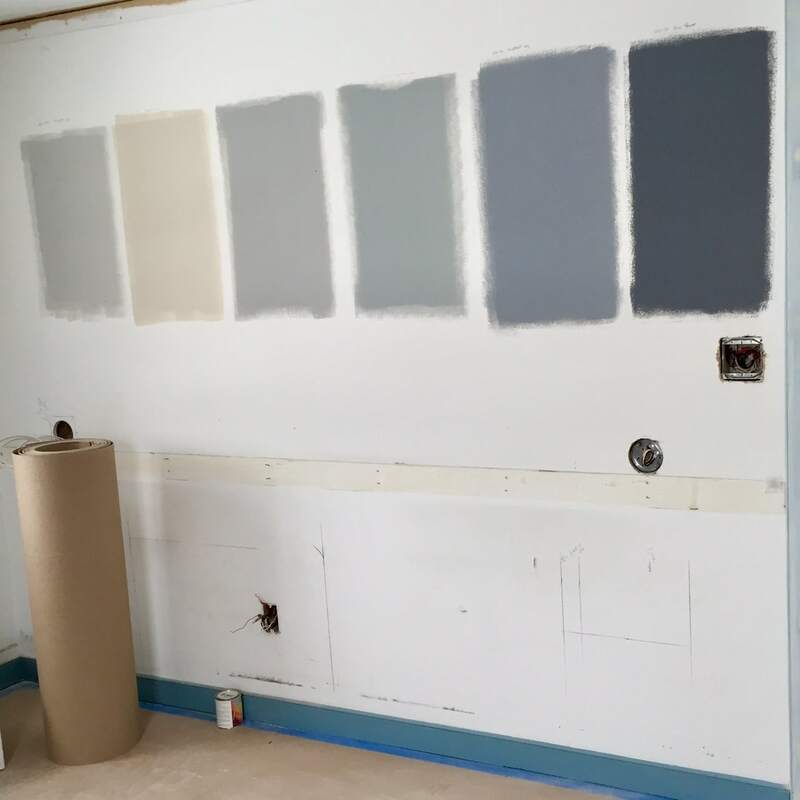 [we went through 6 different paint colors in this den to find the perfect shade of blue-grey. and the second color from the left that looked grey on the paint chip certainly did not look grey once sampled in the room! can you guess which of these colors we ended up using? take a look at the completed room in the picture below. 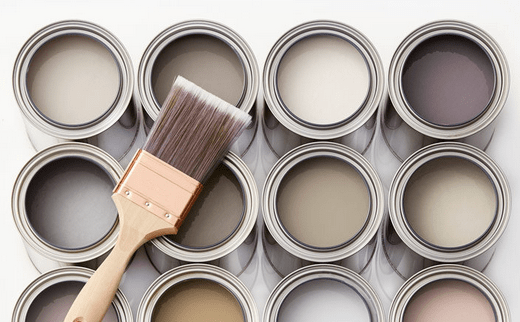 why is sampling paint colors in their intended room so important? aside from the fact that many individuals struggle to visualize what a color will look like in their room from a teeny, tiny painted piece of paper, there are other variables within a space that can drastically alter the appearance of a color. what are those variables? so glad you asked! lighting! how is the room lit? incandescent bulbs add a warmer, more yellow hue to the colors they illuminate. led bulbs – a great alternative to the soon-to-be extinct incandescent bulbs – come in an array of color temperatures from cool bright white to warm to soft white. i always prefer soft white led bulbs! halogen bulbs are more resembling of natural light and make all colors look more vivid. using halogens would make the transition from daylight to artificial light less jarring. florescent lighting (please tell me you are not using florescent bulbs in your home!!) emits a cooler, more blue light and changes the colors of the room as a result. 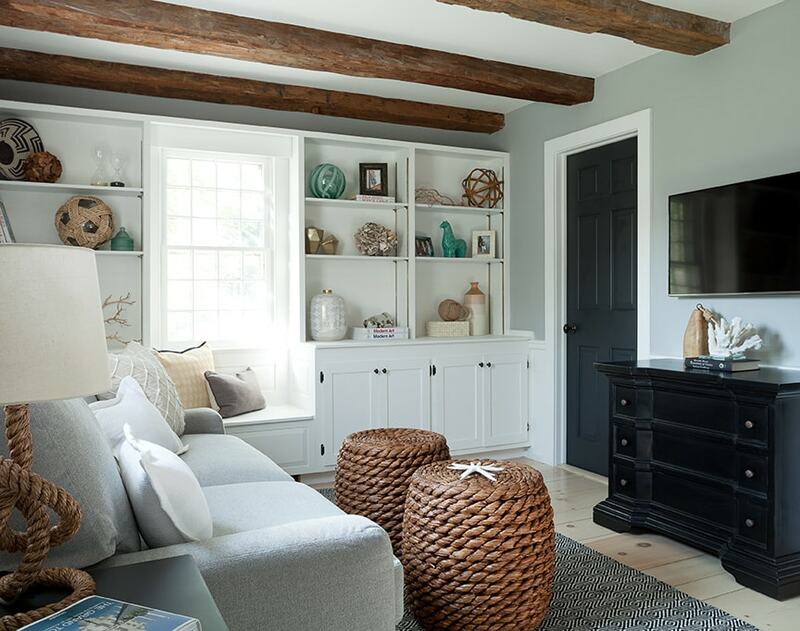 natural light shows the truest color and should always be considered when selecting paint colors. having said that, the direction the room in question faces and how the natural light comes into the room adds yet another layer to how lighting can affect the colors of a room! read on to find out how…..
[if you guessed the fourth color from the left, you are right! but case in point, when this south-facing room was photographed, it was done in the late afternoon when the natural light was flooding in. if you were to see this room first thing in the morning the wall color reads much darker and moodier. north-facing rooms can be a bit challenging. the light in these rooms tend to be cool and bluish. so, instead of fighting it, work with what you’ve got! typically bolder colors show better than muted colors, which will look more subdued. 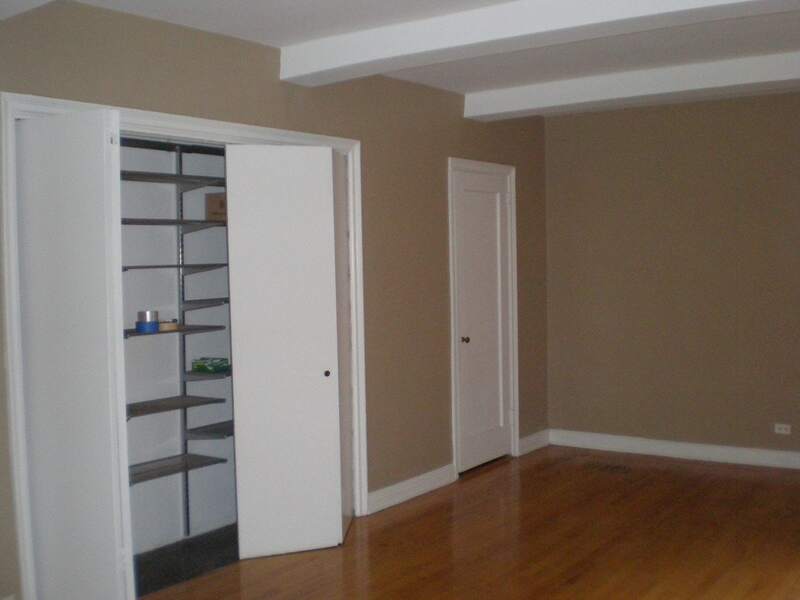 south-facing rooms, on the other hand, are a joy for picking paint colors! they are full of warm light and therefore work well with cool and warm colors! east-facing rooms are filled with light that is warm and yellowy before noon and then turns bluer later in the day. generally speaking, i love sampling different shades of grey in east facing rooms and checking back periodically throughout the day to see how amazingly the colors change. west-facing rooms provide the best evening light and offer a beautiful warm feeling at night. but be sure to check the color you are sampling during the morning hours as the morning light can produce shadows and make colors look dull. 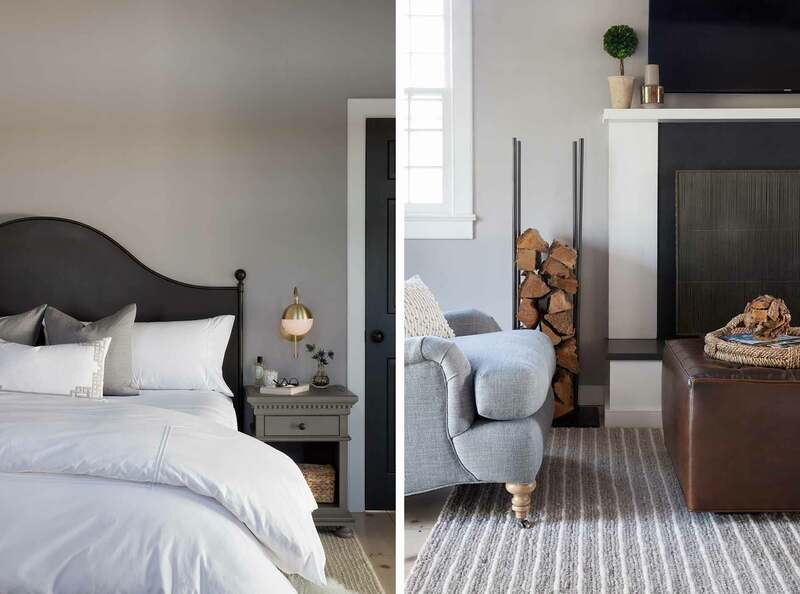 [here’s an example of how natural light can alter the read of color in a room…..these two images are of the same room, at about the same time of day, but the bed wall – which is tucked back away from the windows – reads darker and moodier that the wall near the chair and fireplace. so, now that you know a bit more about how light can affect the read of a color, where oh where to sample your paint options?? I always recommend sampling a color in at least two locations of a room: one sample directly opposite the window and one sample directly next to the window. why? the sample opposite the window will read its lightest and brightest while the color next to the window will read its darkest and dullest. do you love the color in both of these locations?….well then, you may have just found your winner! oh, and when sampling the paint colors, be sure to paint a large enough sample – at least a 12″ x 12″ square – and that the sample square is fully saturated with the sample color so as to not pick up the existing wall color behind it! how about it?? are you ready to try your hand at selecting a new paint color for your place? if you’re still not confident in choosing your new wall hue and you’d like some professional expertise, we are here to help!! for this last recap i wanted to pull back the curtain and go behind the scenes of the bathroom transformation. 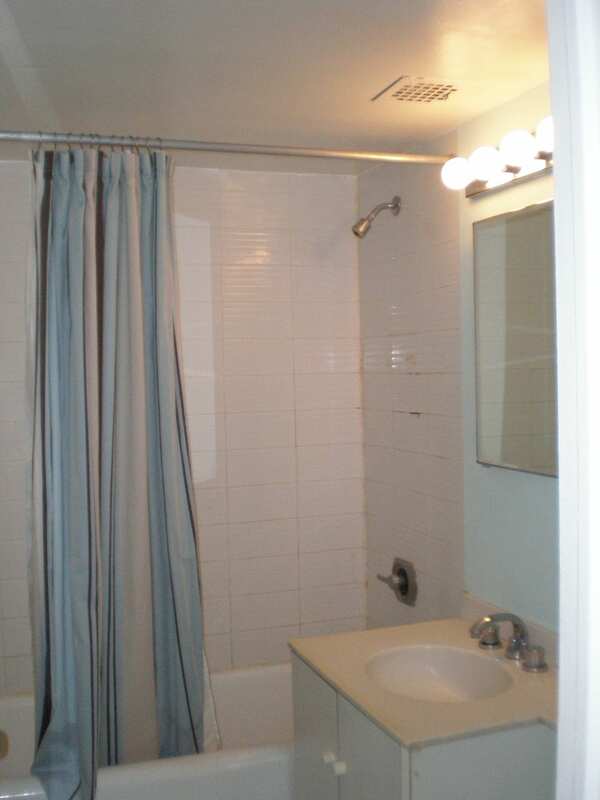 before: the bathroom had a lower ceiling height than the rest of the apartment and could not be raised. additionally, we didn't have the ability to move walls to enlarge the bathroom in any direction. demo! 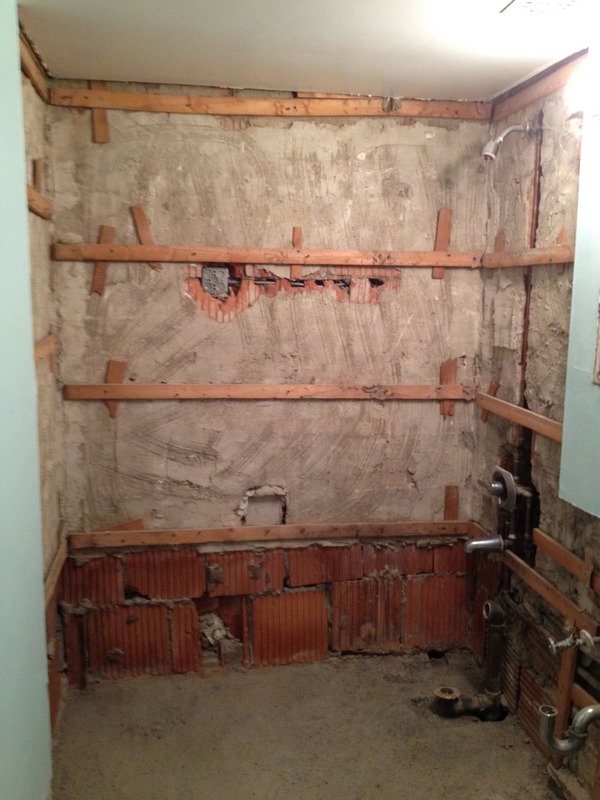 the entire bathroom was demoed down to the concrete and framing. a new shower curb takes the place of where the tub once stood. our clients wanted a large walk-in shower in lieu of a tub and we wanted to keep the bathroom as open and light as possible. to that point we used a 6″ x 12″ white stone tile and installed them in an off-set pattern to help create a wide visual illusion. 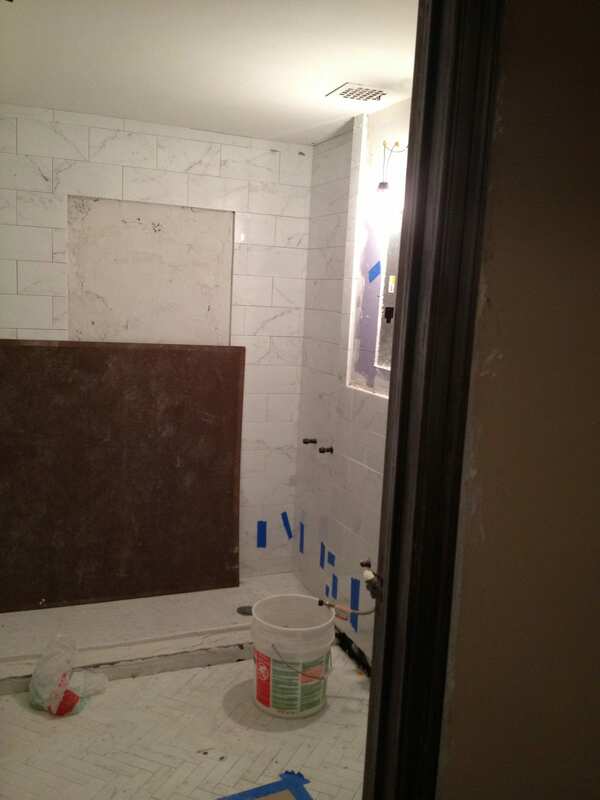 finishing up all of the wall tiles and prepping the center wall of the shower for a feature mosaic inset! we kept all of the stone material in the same family but changed up the pattern. on the floor of the bathroom we used a herringbone pattern - again to elongate the space - and on the shower floor we used a mini-herringbone mosaic. 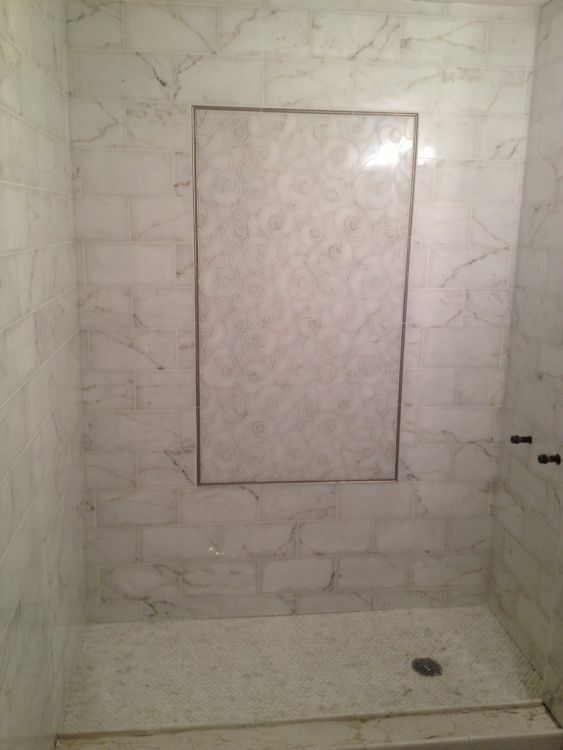 to add drama and depth we selected a beautiful modern floral mosaic to be used on the main shower wall. 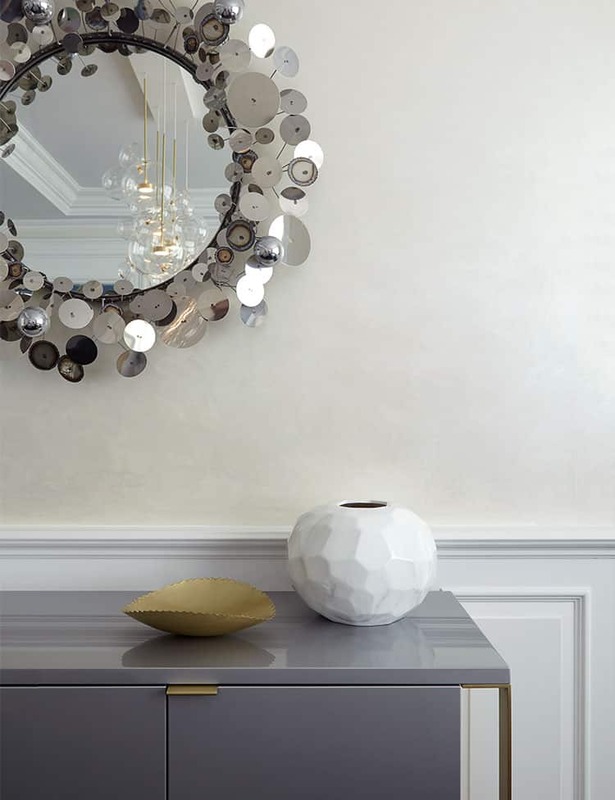 the mosaic inset was framed with a beautiful concave bronze metal banding. to ensure that this feature wall was not hidden from view, a solid 30" wide sheet of glass would be installed from the curb to ceiling to keep the space feeling open and bright. 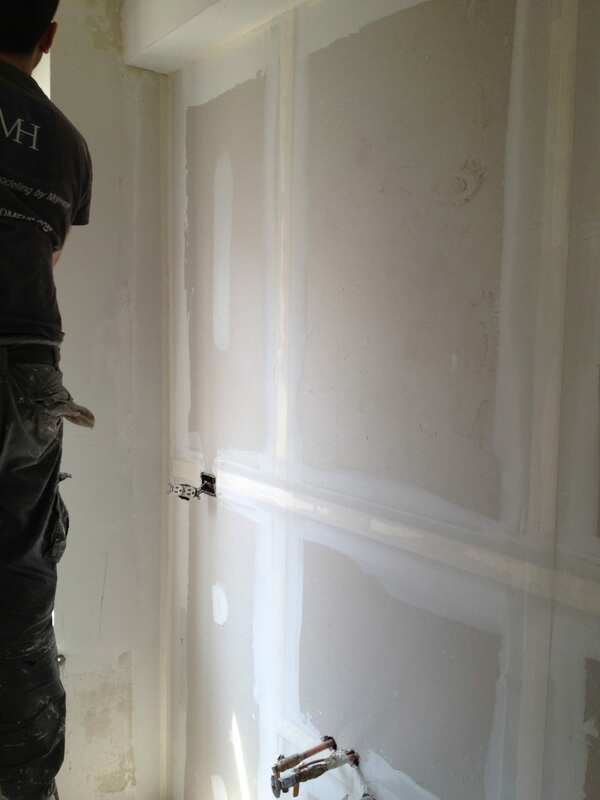 and we chose not to add a shower door to continue the light and airy feeling. as this pied-à-terre was not our client’s main residence and storage was not of a concern, we opted for a classically designed pedestal sink. and in keeping with the classic and pre-war detailing of this space we selected exposed shower fittings which looked like gorgeous jewels suspended from the walls of the shower. it’s true what they say…..bathroom renovations can be one of the dirtiest and most pricey parts of a renovation, but when done right they are so worth it in the end!! are you thinking of doing a bathroom renovation? what design style and decorative elements would you choose? we’d love to hear from you! 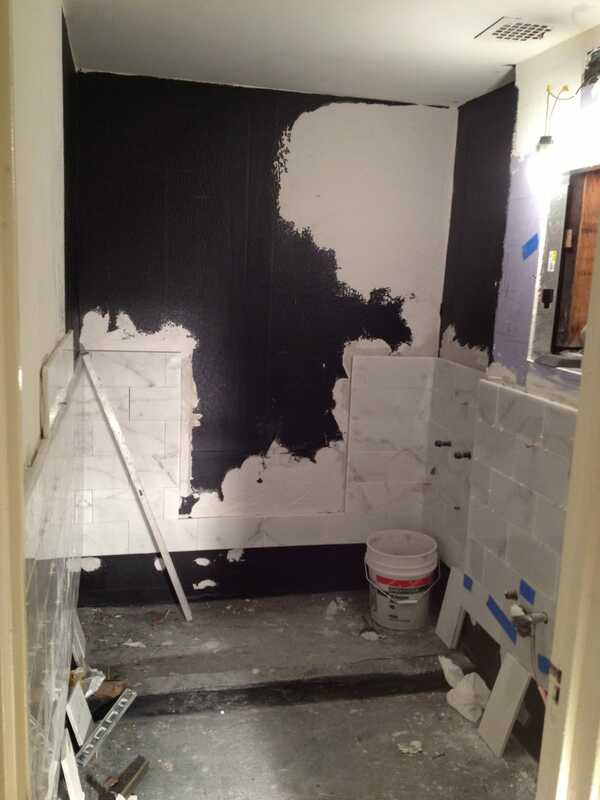 UPDATE 4/12/18: want to see other exciting bathroom renovations? Check out this recap of my dramatic bathroom gut renovation—truly the ugliest bathrooms of my career! 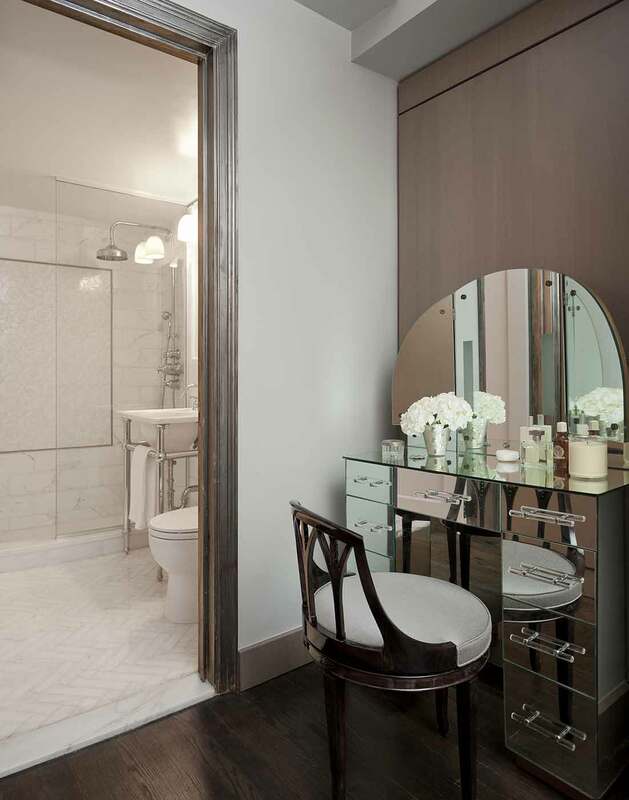 Or check out how to get the look of my contemporary tribeca bathroom. Still want more behind the scenes recaps? This design reveal of my florida beach house won’t leave you hanging! one of the quickest and most inexpensive ways to bring new life to a space is with paint. and one of the questions i’m most frequently asked is what my favorite paint colors are. 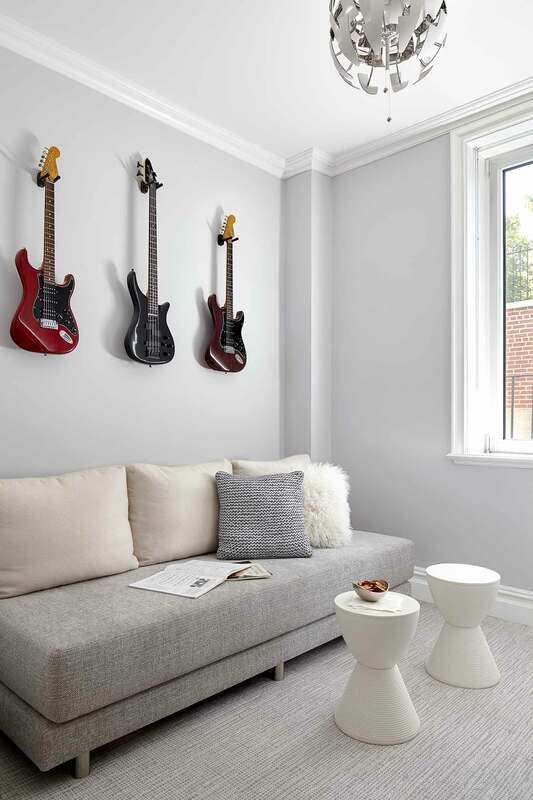 well, anybody who knows me knows that [for the most part] i like to keep the walls in my interior projects crisp, clean and neutral….and for me, the perfect “neutral” color is a shade of grey. the questions that always seems to follow”what color should i paint my walls?” is then about the trim work. 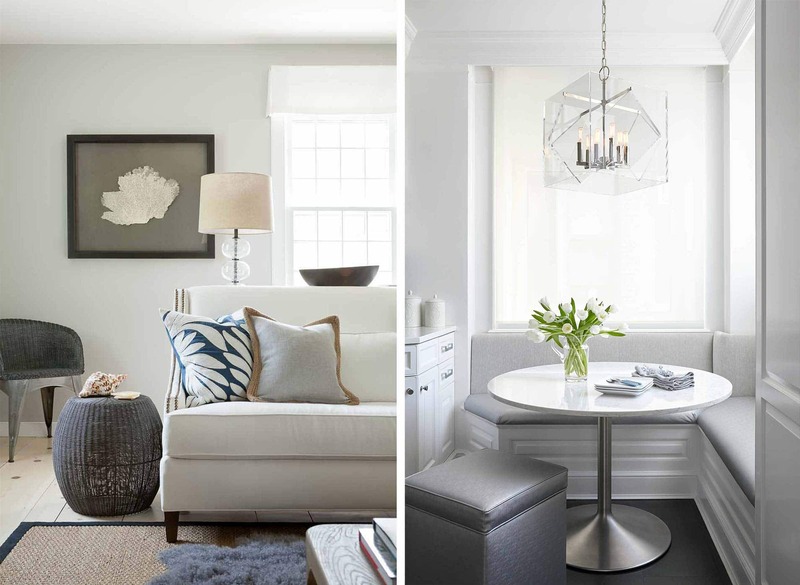 again, for me, crisp and clean, white and bright almost always wins out! all the trim work throughout this gorgeous pre-war 5th ave. project was done in benjamin moore super white. so, exactly which paint colors are my favorite? keep on reading and find out below! while this post might answer the question of what my favorite go-to colors are, next week we will discuss all the different things to consider in finding the perfect color for you! we will look at things like where’s the best place sample colors on your walls and how lighting or the direction your room faces can play a major roll in how colors look in your space. so, stay tuned! until then……. today we are going to look at the transformation that took place in the kitchen. our clients were very, very clear about how they were – or more to the point how they were not – going to be using their kitchen: it was be used strictly for making morning coffee, making evening cocktails or warming up the leftovers they brought home from a fabulous restaurant they patronized the night before. to that point, we removed the stove and capped the gas line, installed a convection microwave oven and installed an under counter drawer fridge and freezer unit [not pictured]. 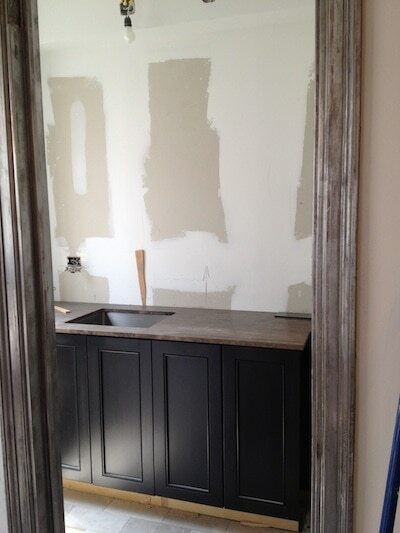 as for the finishes, we opted for dark cabinetry with blackened steel hardware to sit atop warm grey stone flooring. the counter tops we selected had a gorgeous horizontal striation to them that helped to visually widen the space and the mirrored tile back splash not only added drama but added depth to an otherwise shallow space. 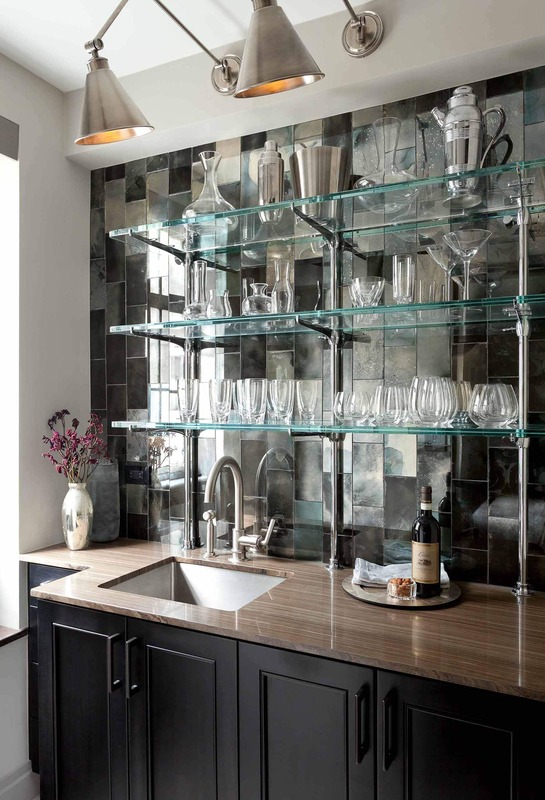 in trying to keep the kitchen to feel as open as possible [not to mention wanting to add interest and a beautiful focal point] we custom designed an open shelving unit with the glass shelves resting on classically inspired polished chrome brackets. 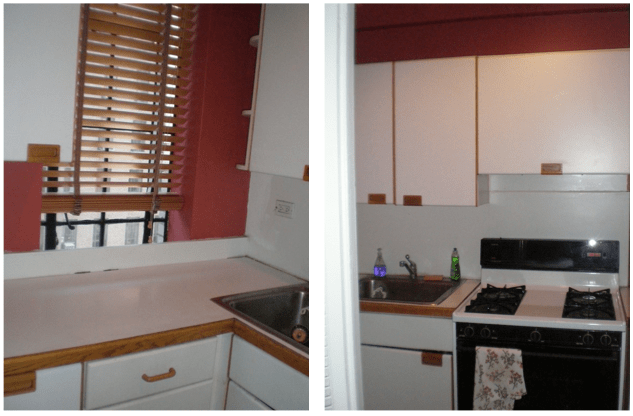 take a look at the photo diary below to see how this awkward kitchen was transformed into a jewel-box of a space. before: an awkward corner of the kitchen obstructed the beauty of the gorgeous pre-war lead paneled window. demo time! one of my all time favorite times to be on a job site! 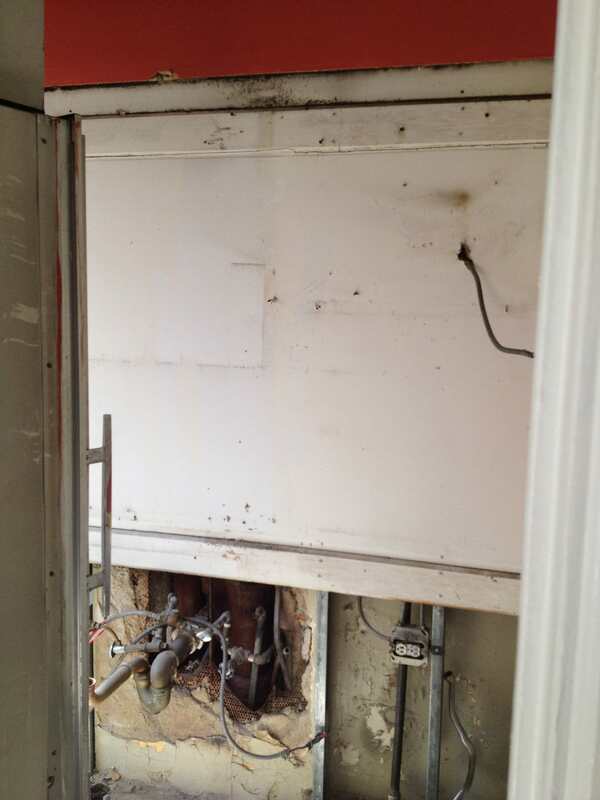 once everything was removed, new plumbing pipes and shut-off valves were installed along with new gyp to ensure the walls were smooth and even. stone flooring, base cabinets and counter top were installed! up next, the gorgeous back splash and sconces! 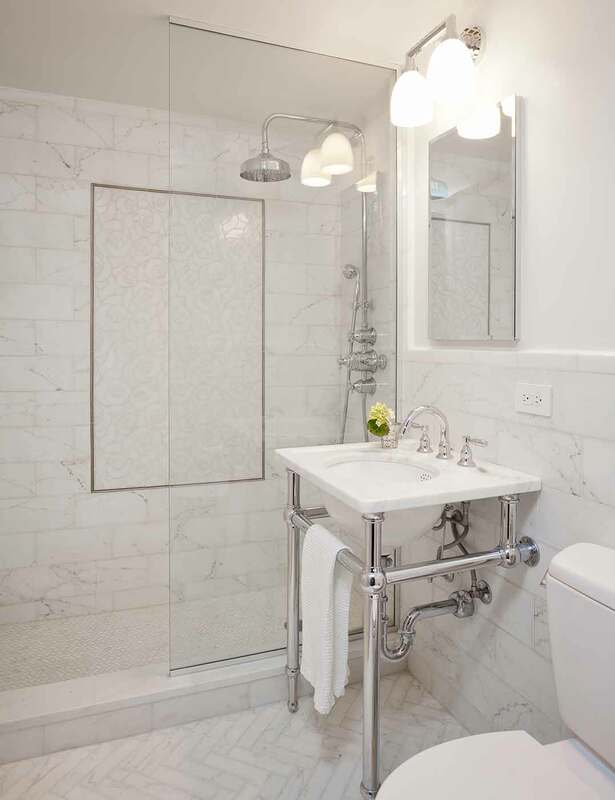 we chose an antiqued mirrored tile for the back splash which played beautifully off of the pre-war aesthetic of the building as well as brought some reflectivity to help make the small space feel larger. 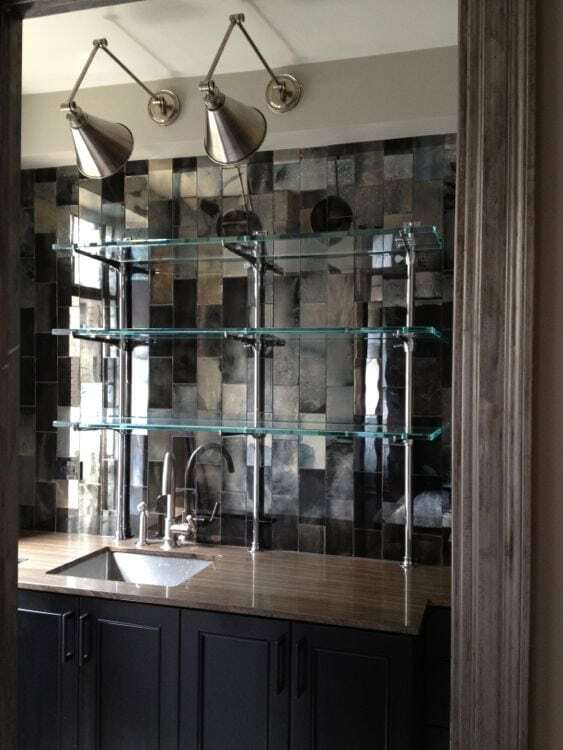 last but not least, the gorgeous glass and polished chrome open shelving unit was installed. here's where things got....sticky shall we say? 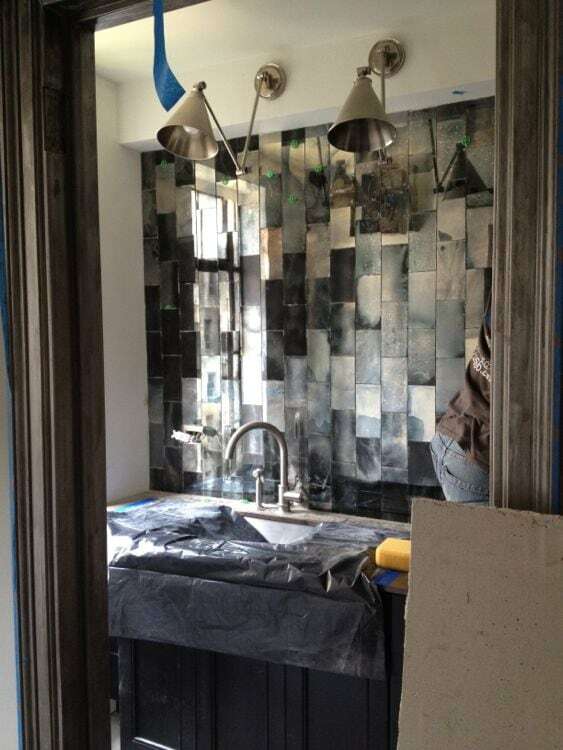 several of the mirrored tiles cracked once the structural brackets were attached to the wall and had to be replaced. it was not an easy fix but it was fixed nonetheless! ready for the big reveal! our clients were beyond thrilled with the dramatic change that this otherwise drab and dated kitchen went through. isn’t this incredible space just begging for a martini to be made in it? do you need help bringing new life to your outdated abode? we are here and happy to help! just say the word!! 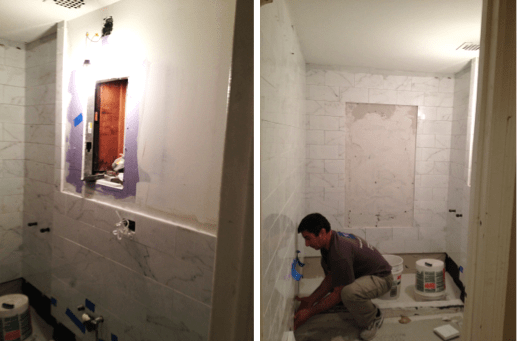 UPDATE: check out renovation recap part iii for a behind-the-scenes look at the bathroom transformation! 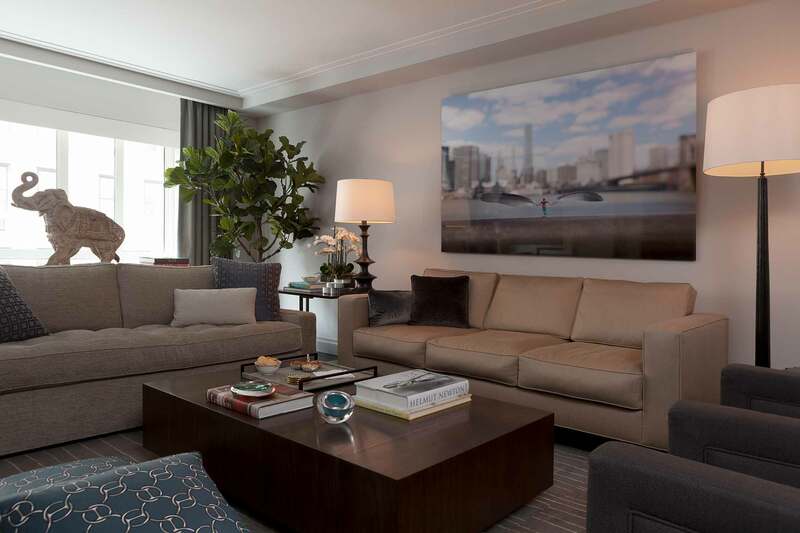 one of the greatest joys i get from my job is working with amazing clients on completely transforming their spaces into a tranquil oasis that completely reflects who they are and how they want to live. but what happens between the time that we sign a new client and the moment of the big reveal? what does the process look like and what are some of the design challenges we face? i thought it might be fun (maybe even informative?) 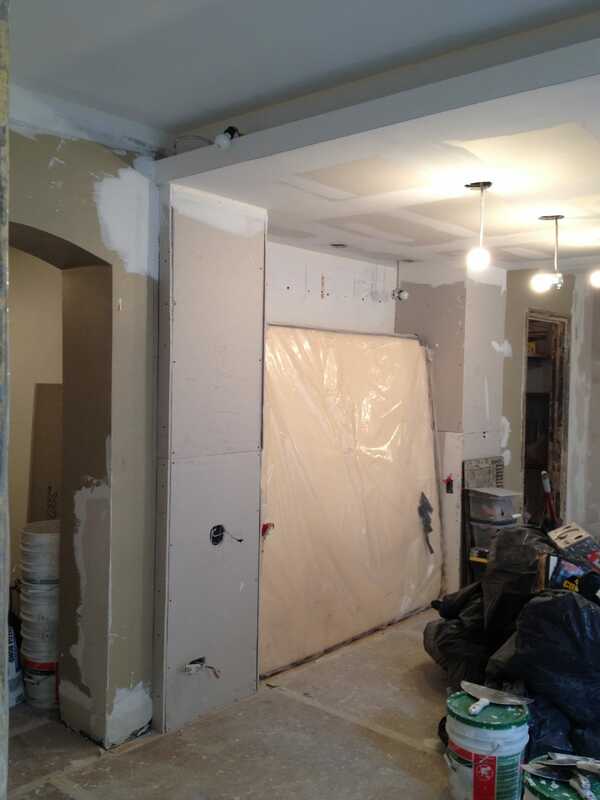 to pull back the curtain a bit and show all that goes into a gut renovation project. 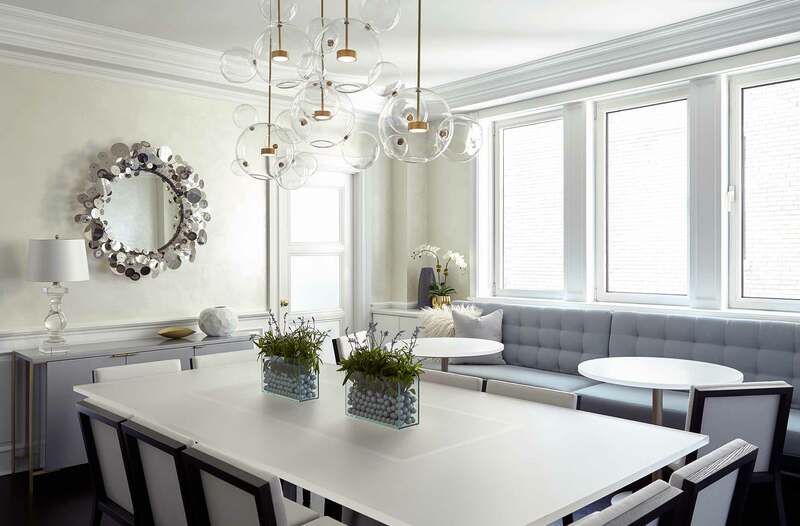 case in point, i’d love to walk you through the renovation of this upper west side pied-à-terre that we completed a few years back. for part I of this renovation recap, i will focus on the main living area. their main residence is just on the other side of the hudson river in new jersey but, given their love of the arts and entertainment, they found themselves making frequent trips into the city which often included overnight stays at some of the city’s chicest hotels. when they finally decided to purchase a place in the city that they could call their very own they enlisted my firm in helping to make their dream a reality. top on the wish list: 5-star hotel-like digs, a beautifully equipped kitchenette to be used solely for mixing cocktails or making morning coffee (no oven! ), a relaxing nook for reading or enjoying said cocktail, no tv, and a luxurious space for dressing for a night out on the town. because storage was not a huge priority and the smaller closet on the far right of the room offered just the right amount of space, the first thing we decided to do was rip out the existing double-door closet. I wanted to make this area more of a focal point and to that end decided to recess a custom upholstered wall with wood headboard into the niche area that once housed the larger closet. additionally, we wanted to reduce the visability of all of the structural beams in the ceiling as well as add more overhead lighting. due to the fact that the ceiling were concrete and recessing lighting was not an option we decided to lower the ceiling over the bed area and aligned it perfectly with the “wing walls” that flank the bed. by lowering the ceiling in this area we accomplished two things: 1] we were able to hide two ceiling beams and 2] we created enough depth which would allow for us to add down lights. during: the newly defined headboard wall is articulated by adding a dropped ceiling which not only allows for the addition of down-lights and perimeter lighting cove but also reduces the number of visible structural ceiling beams. once all of the framing was in place and lighting was installed, it was time to add the custom mill work that would really help delineate the sleeping area from the rest of the open living area. i designed the back of the headboard to have enough depth to act as a shelf to hold decorative accessories as well as add dimension as a focal point of the bed area. to bring another layer of interest to the sleeping cove, i designed the walls flanking the bed to bump out from the face of the surrounding walls and clad them in the same wood as the headboard. 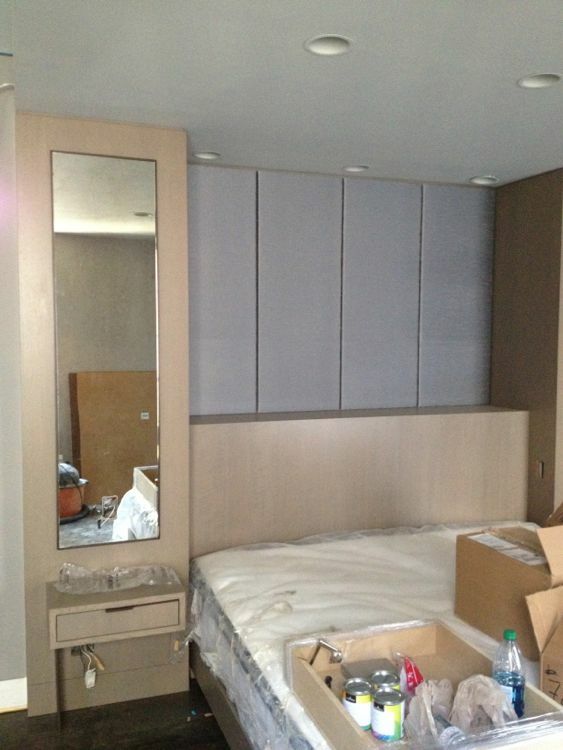 the bump out walls included inset antique mirror within a bronze boarder and custom “floating” bedside tables. custom mill work included inset antique mirror recessed within a stunning 1/4" wide bronze frame. wall sconces to be installed on the antique mirror. by paying attention to all of the intricate detailing of this sleeping area we created a luxurious space to lay ones head, invoke the sweetest of dream and promise the utmost in relaxation. let me know what you think of this “behind-the-scenes” post! 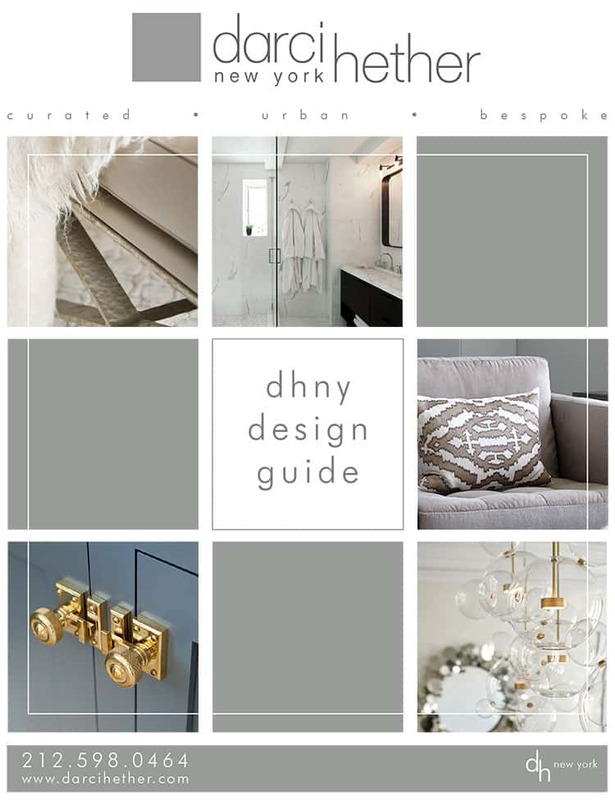 and stay tuned for renovation recap, part ii & part iii of this pied-à-terre where we will look at the stunning renovation of the kitchen and bathroom. happy friday everyone! i hope your week was one of rewarding moments, friendly connections and tasty treats! luckily my week included all of the above (not every week does!) and now i’m gearing up for a weekend filled with some fun hubby birthday celebrations! i thought i’d close out this very productive and inspiring work week by sharing with all of you some of my latest swoon-worthy obsessions. enjoy! travel: bordeaux ~ i recently read a wall street journal article that made me want to immediately stop what i was doing, grab my passport, throw some chic yet comfortable (read: expandable) clothing into my suitcase and head straight for the airport. i’ve been dreaming of going to bourdeaux for some time now and this write-up cemented it! 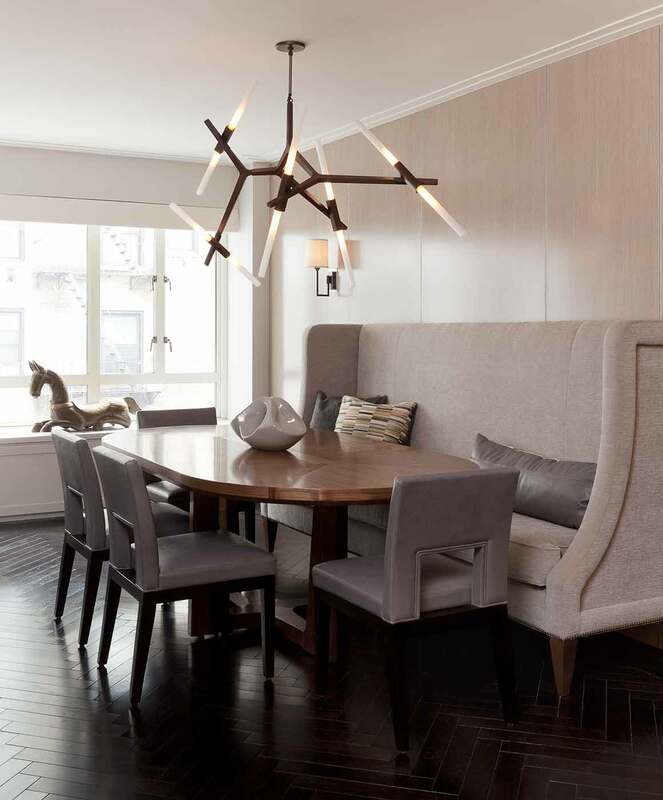 lighting: aura pendant ~ pretty much anything alison berger creates is off the charts stunning! and her aura pendant is no exception. the metal work! the glass work! the attention to detail! pure perfection! shoes: metallic mules ~ please, please, pretty please!! my love for these shoes knows no bounds! is it in poor taste to ask santa for an early christmas gift? 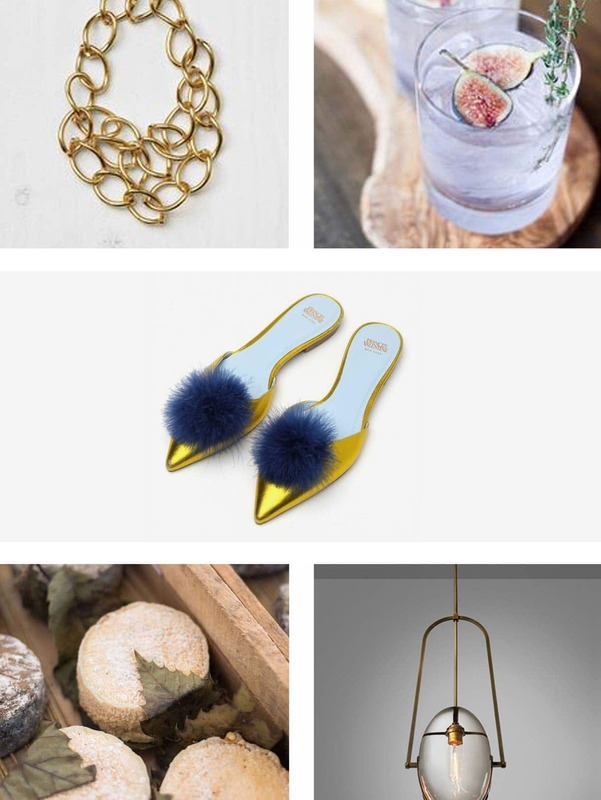 jewelry: twisted brass ~ anyone that knows me knows i love a great statement necklace. this one certainly checks all the boxes! the detailing of the connection of each of the brass links is so thoughtful and unexpected. again, santa, are you listening? cocktail: fancy figs ~ yup, it’s friday and in my book that always calls for a little libation celebration. 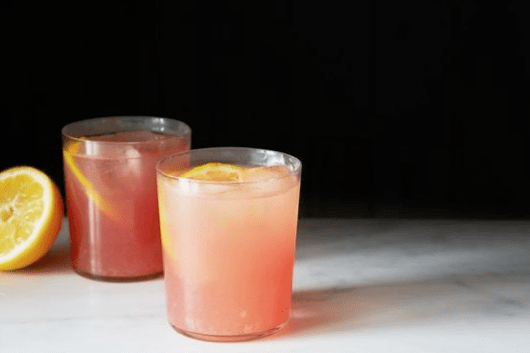 i found this beauty via pinterest which then led me down the rabbit hole of other fig inspired cocktails which then led me to this yummy somethin’-somethin’.….you had me at bourbon! i can’t wait to try it out. how about you? what are some of the fun things you’ve been obsessing over lately? let me start by saying that this is not a sponsored post! there, now that we’ve cleared the air on that potential thought, i feel i am now able to speak (type?) freely of my love of all things holly hunt. while this topic could go off in many different directions regarding said love, for today let’s just focus on their incredible outdoor fabrics! but before we delve into that subject matter let’s just rewind a bit and revisit what outdoor fabrics used to be considered: tacky, uncomfortable, plastic-like, not stylish….basically in a word – hideous – and only to be considered for use as a necessity for poolside furniture. thankfully that is no longer the case! and we all have the holly hunt great outdoors fabric collection to thank in large part for that! while there are many other textile companies that create beautiful outdoor fabrics, i find that the gorgeous textures, patterns, weaves and color palettes that holly hunt produces are some of the most chic and modern in the marketplace. because the feel (or hand), wear and comfort of their outdoor fabrics is so luxurious yet durable, we’ve been able to confidently design and present light and bright furnishings to our clients. do you dream of lounging on a white sofa while enjoying your favorite red wine but fear that your accident prone significant other or clumsy cocktail guest (because we know that you would never spill) will quickly turn that glorious thought into a cleaning nightmare? do you worry that a luminous color story made up of light and bright fabrics won’t allow you to “live” in your living room? do you still hold on to that old way of thinking that one’s dining chairs should either be made of wood or faux leather because they are the only finishes that can be wiped clean? well, fear and worry no more!…holly’s got you covered! the great outdoors fabrics are created using 100% solution dyed fibers which are then spun into the yarns that make up their stunning outdoor fabric collection. due to the 100% solution dyed acrylic fiber base, the fabrics that are then created are sun, wear and tear, and even bleach(!) impervious! so, pour that glass of red with confidence! invite over your klutz of a neighbor! live on the light side! you will love how these fabrics stand up to whatever life throws your way. so, what do you say? are you ready to take the worry-free plunge? 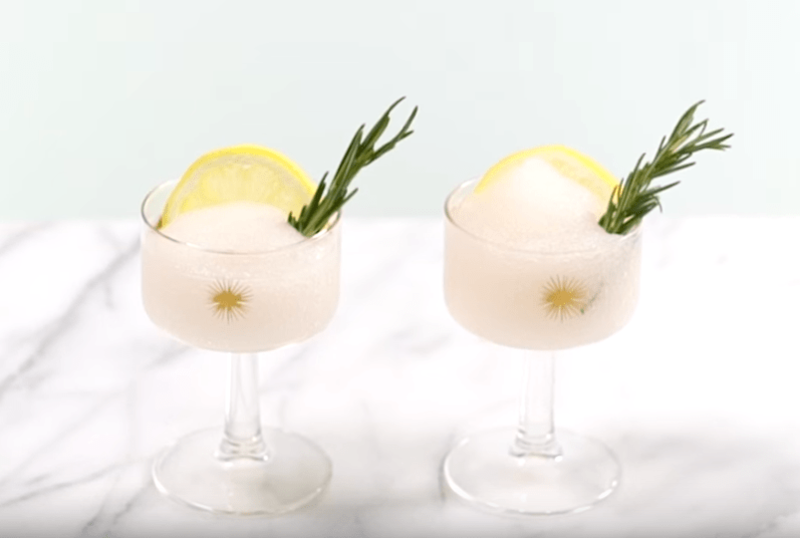 in prepping for a little summer soiree we’ve been planning, i totally fell down the pinterest cocktail rabbit hole while looking for a little libation inspiration. very dangerous! at first i was wanting to keep it super simple with some summer rosé and nibblets but then…..this happened! i tried a couple, ok a few, ok…..several of these yummies and trust me when i say you won’t be disappointed! the watermelon rosé margarita was probably top of my list because [a] tequila and rosé together, [b] watermelon and [c] peach garnish? i mean c’mon! all of my summer favorites in one very salted and chilled cocktail glass! what could be better than that? oh, well since i asked, this one could very well be better than that…..
and because i sometime like something a bit fizzy, i added a touch of seltzer water to this cocktail and it was pure perfection. so, before the season is over, i hope you have a chance to try one of these refreshing concoctions and sip in the last lazy days summer. and if you’re dreaming of enjoying one of these delish beverages in your newly renovated and well appointed abode give us a call! we can create the perfect space for you andcelebrate by mixing up for you your preferred elixir of choice! how about you? what is your favorite summertime cocktail? please share!